Slot ‘N’ Roll is a new stunning video slot by the leading software creators, Spinomenal. As it is their trend, Spinomenal has hit the industry with a unique animation slot. So, if you are an anime lover, then you have all reasons to play this game. Nevertheless, non-anime punters too have a reason to play this slot because of the numerous winning features. On top of that, the graphics and the epic rock soundtracks have been brilliantly used as you would expect it to be. Other than being mobile-compatible, Slot ‘N’ Roll has been animated with a key player –protagonist. The protagonist a manga young boy standing on the left-hand side of the board moving occasionally as if adjusting his position. Slot ‘N’ Roll is a 5 reeled animated video slot with 25 fixed paylines offering a betting range of between $0.25 to $250 coins. Despite the slot being a low limit game, it has more in terms of entertainment to lure punters into playing it. This slot can be played in two ways, the auto play or the manual mode. Moreover, the introductory part of this slot is amazing with flashing lights, dazzling lights, animations and sound effects. The most captivating part of this slot is the special animation which pops up on the gaming screen at any point of the game. Also, the themed symbols which animate into black/white or colored is unique, drawing you into playing. Punters too have a starter package with wild, scatter symbols and a bonus feature. A slot is not complete without a wild, a scatter, bonus features and a handful of free spins. 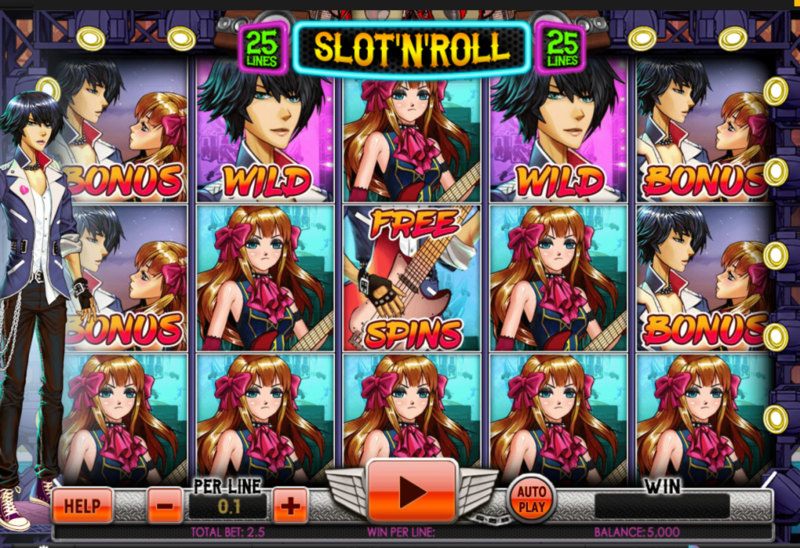 Slot ‘N’ Roll has used a close-up of the Emo boy as the wild symbol, the close-up of the boy with his girlfriend as the bonus feature and a close-up of a boy playing guitar as the free spin trigger. The close up of the Emo boy (the wild) will substitute all regular symbols. It awards up to 250 times when 5 of them appear on the winning bet line. Next, we have the bonus feature represented by a close up of a boy and his girlfriend. If you land 3 or more of these bonus features, you will activate the bonus game. Finally, we have an amazing feature of free spins that is represented by a close-up of a guitar. If you happen to land 3 or more of the icons on the lines, you will be awarded 7 free spins instantly. Hold on, there is more about this video slot with the special symbols. There are hearts with multiplier symbols that will appear on the game board offering a payout ranging between 2x to 5x. In addition, stacked wilds might appear between 1 to 5 times in the game and they are represented by a full animation of a boy playing guitar on stage. These, among other features, make Slot ‘N’ Roll the best-animated slot so far. Using the latest inventions in gaming technology, Spinomenal has used HTML5, Java Script and Flash to provide a smooth gaming experience for Windows, Android and iOS powered device users. It is indubitable that anime themed video slot are not so many in the casino industry, thus, it is time for you to be counted among the pioneers of animated slots. If you are looking for a similar anime by the same creators- Spinomenal- then you must try out Wild Spin. Like Slot ‘N’ Roll, you will come across elegant graphics and rock tracks to keep you high spirited as you game. Enzo casino was recently established in 2016 and it has been providing high-quality games from some of the leading providers today. This mobile-compatible casino has a welcome bonus of 300% up to £150 to all its members. The security of the casino is enhanced through SSL encryption technology thus providing a safe banking and gaming environment. Moreover, Enzo has a well established and knowledgeable customer support team which is available 24/7 on Telephone, live chat, and email. With less than a year in the online casino industry, Times Square has achieved a lot in terms of games, security and customer service. This casino is famous for updating latest game variations with superb themes, graphics, and sound effects. All new gamers receive a welcome bonus of 300% up to £1200 on all games. As well, Times Square supports different languages and payment methods making it more accessible from different parts of the world.